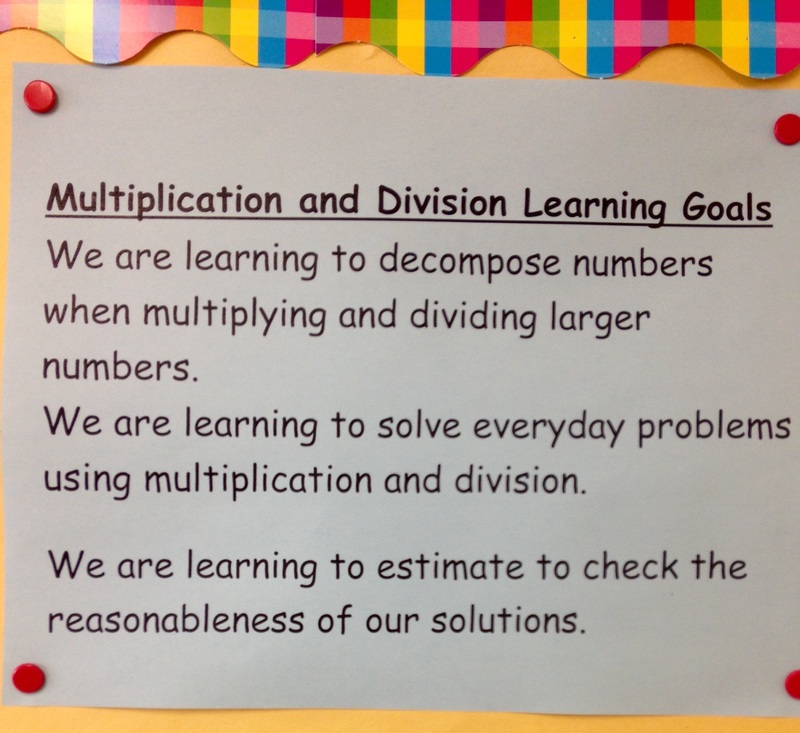 Recently I had the opportunity to work in a Grade 6 classroom as they began a unit on division and multiplication. The teacher gave the students the following problem from the Ministry support guide (division) to begin. The purpose for that day was to see what the students already knew. A grandmother gathered 128 seashells while on vacation. She wanted to divide them equally among her 4 grandchildren. How many would each child get? We were concerned that this problem would be too easy for many of the students, but we wanted to see if they had a variety of strategies. Many of the students were able to do the standard algorithm for division. When asked to solve the problem in another way, the two students I was observing said that they could do a picture, but that drawing 128 dots to represent seashells would take a long time. I challenged them to find another way using what they know about numbers. They were stuck. This is an example of a pattern I have observed in my work in a variety of situations. Students can draw a picture to represent a division or multiplication problem and perform the standard algorithm (equation) but are challenged to work with the numbers in a different way. This gives me valuable information about their sense of number. It is this inability to do something different with the numbers that intrigues me about students. I believe that this is an opportunity to build flexibility with numbers to impact multiplicative thinking. Students who are flexible thinkers understand that numbers can be decomposed into parts in many different ways. With just a bit of prompting the two students decomposed 128 into 100 + 20 + 8 and divided each of these by 4 to get partial quotients. They knew they had to add the partial answers to get the final answer. Although the students did not think of doing this, they understood it completely when introduced to it. Now they have another strategy to add to their repertoire. Having different strategies inspires students to engage in the mathematics in a way that makes sense to them and it is often these strategies that promote understanding of the standard way of performing procedures. Guided practice is an important part of an effective mathematics program. After highlighting this strategy for division at the end of the shared portion of the lesson, we had everybody practice this strategy using different numbers. There is no need to add another story problem to this as we have already provided a context with the original problem. Let’s work with the numbers and focus on the math. We stuck to simple numbers so that students would get the idea. At the end of the lesson I asked the students what they had learned today and many hands went up: one student said that she learned that there were many different ways to divide. Another student said that he learned that you could segment numbers and divide those parts. I talked to the teacher about how the learning goals had emerged from this lesson and can now be posted, added to, revised, and referenced as the work progresses. He is going to choose a student sample of the division strategy we highlighted today to go up as the start to a strategy wall. As different strategies are focused on they too will go up on the wall with a student sample as a visual. Ultimately, we want students to feel confident with a variety of strategies. It is this comfort or flexibility with numbers that impacts their fluency. This will build procedural fluency which is understanding of the the standard algorithm rather than just rote memorization of steps. -We understand that there are different ways to divide. How might an understanding of the distributive property impact student fluency with numbers? Previous Previous post: Success Criteria – Timing is Everything!